Prime Minister Narendra Modi is in Haryana's Kurukshetra today where he launched several development projects ahead of the Lok Sabha general polls due in a few months. 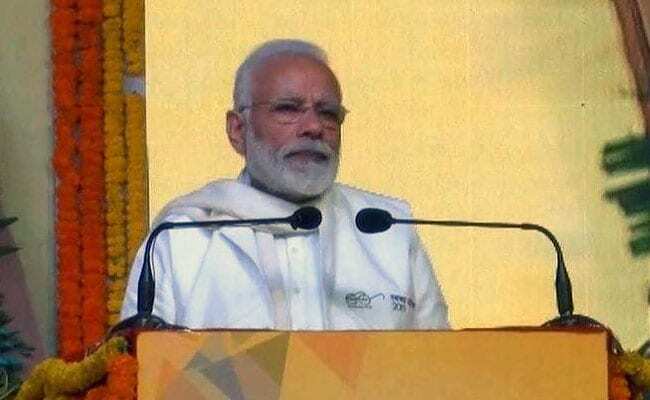 Prime Minister Narendra Modi is in Haryana's Kurukshetra today where he launched several development projects ahead of the Lok Sabha general polls due in a few months. PM Modi laid the foundation stones of five projects, including three of the health and Ayush ministries. PM Modi also launched the country's largest cancer institute at Bhadsa in Haryana's Jhajjar district. He also addressed a public rally in Kurukshetra on this occasion. Earlier today, BJP president Amit Shah started the party's ambitious 'Mera parivar, Bhajapa parivar' campaign by hoisting its flag at his home in Ahmedabad as it seeks to cover over five crore houses under the drive ahead of the announcement of the schedule of Lok Sabha polls. The exercise will last till March 2 and the BJP aims to plant its flag at five crore homes of its workers and sympathisers across the country. Meanwhile, Congress President Rahul Gandhi continues with his attack on the Modi government over the Rafale scam, alleging that the Centre finalised an overpriced deal for 36 Rafale fighter jets at an inflated price to benefit Anil Ambani, whose inexperienced defence firm was recommended as an offset partner for Dassault, the company manufacturing the aircraft. On the way to Kurukshetra, captured a picture of the sacred Brahma Sarovar. From Haryana's soil, we had set a huge target. From one rank one pension to beti bachao beti padhao, we launched all of them from Haryana that spread across the country. The first beneficiary of the Ayushmann bharat scheme was also a daughter from Haryana. Today we have dedicated medical and cultural projects to the public. Jhajjhar's National Cancer Institute, Kurukshetra's Ayush University, Karnal's Health Science University, Panchkula's National Institute of Ayurveda and Faridabad's ESIC medical college and hospital. With this, the youth will also get employment through the projects. With Beti Bachao, Beti Padhao, the population of girl child has increased. With the Ujjwala Yojana, sisters are now free of smoke. The National Nutrition Mission and Prime Minister's Safe Maternity Campaign has reduced threats to the lives of pregnant women. We have been the first government to impose death penalty for rapes. The Pradhanmantri Awas Yojna has given houses to people. Women get to register their names for houses, that is being given priority. Daughters are being encouraged to contribute beyond the kitchen. We have got our first female fighter pilots in the country. For women to take care of their newborns, we have extended maternity leaves from 12 to 26 weeks. Approximately 75% of the 15 million loans are loaned to female entrepreneurs. About 6 crore women have been joined by self-help groups under the Din Dayal atayoday scheme. More than Rs 75 crore of loans have been provided to such self help groups. In about 70 years of independence, the scope of hygiene was nearly 40%. It has reached 98% today. More than 10 crore restrooms have been created in the 4 and half years. 5 lakh villages in 600 districts have freed themselves from defecation in open. Be it poor health or a middle-class family, the Government is widely making efforts. Be it the network of large hospitals, be it 1.5 lakh wellness centres across villages or be it Ayushmann Bharat that provides free treatment, we are working towards all these. The government is spreading a hospital network speedily. 21 AIIMS have been operating in the country, or work is being done for their construction. From these, work on 14 AIIMS have been started after 2014. PM Modi will also participate in Swachh Shakti-2019 and distribute the Swachh Shakti-2019 awards. He will visit the Swachh Sundar Shauchalay exhibition in Kurukshetra and address a public gathering. 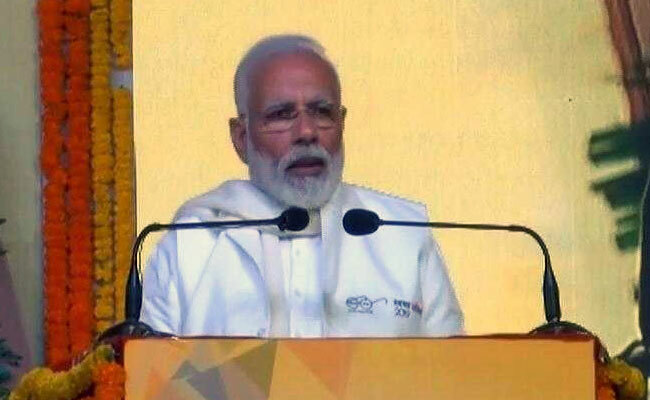 He also laid the foundation stone of Shri Krishna Ayush University, Kurukshetra, which is first of its kind in the world, he said, adding that it would provide education and treatment through ayurveda, yoga, unani, siddha and homeopathic medical systems. PM Modi also laid the foundation stone of Pt. Deen Dayal Upadhyaya University of Health, Karnal and National Institute of Ayurveda, Panchkula. PM Modi laid the foundation stones of five projects, including three of the health and Ayush ministries in Kurukshetra. Prime Minister Narendra Modi has rock-solid support of people ahead of the coming Lok Sabha election, BJP president Amit Shah claimed today. "I travel the country... I can see that people are standing with Prime Minister Narendra Modi like a rock and one can see the support in their eyes," Mr Shah said addressing BJP workers. Launching yet another attack on Prime Minister Narendra Modi over the alleged Rafale scam, Congress chief Rahul Gandhi accused the PM of being industrialist Anil Ambani's "middleman" in the fighter jet deal. "A Ambani, who met the French Defence Minister, mentioned an MoU he is looking forward to sign after the Indian prime minister's visit to France. Mr Ambani says he is first looking to make commercial helicopters. This is a breach of the official secrets act... the PM is the only other person who knows about this... in fact Anil Ambani opened his company after this meeting," Mr Gandhi alleged. "The PM is acting as Anil Ambani's middleman," he added at a press conference. In a scathing attack on Trinamool Congress chief Mamata Banerjee, Amit Shah in Ahmedabad said, "I want to tell West Bengal Chief Minister Mamata Banerjee that Mamata didi, the BJP doesn't succumb to pressure. The BJP only flourishes better under pressure." Ms Banerjee is a strident critic of Prime Minister Narendra Modi and one of the prime movers behind the efforts to cobble up an anti-BJP alliance ahead of the coming Lok Sabha polls. Last week, the West Bengal government denied Yogi Adityanath permission to land his chopper for a rally in Bengal's South Dinajpur. BJP president Amit Shah started the party's ambitious 'Mera parivar, Bhajapa parivar' campaign by hoisting its flag at his home in Ahmedabad as it seeks to cover over five crore houses under the drive ahead of the announcement of the schedule of Lok Sabha polls. The exercise will last till March 2 and the BJP aims to plant its flag at five crore homes of its workers and sympathisers across the country. 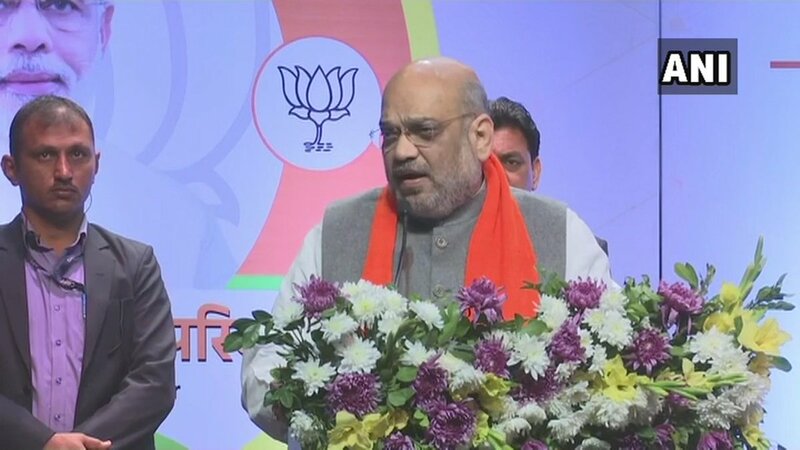 "This BJP flag is a symbol of development, belief and nationalism, and shows how appeasement, casteism and family rule is ending in the Modi era," Mr Shah said, launching the campaign. "On March 3, over three crore motorcycles will campaign in every Vidhan Sabha constituency across the country for Vijay Sankalp rally," Mr Shah said.